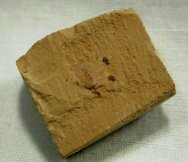 Description: This Primicaris larvaformis fossil is one of the rarest and also most controversial of the Chengjiang Biota. Hou and Bergstrom (1997) first described the taxon as a larval Naraoiid, the soft-bodied arthropods such as Misszhouia and Naraoia within Order Nektaspida (commonly also called Naraoiida, Nectaspia and Nectaspida). 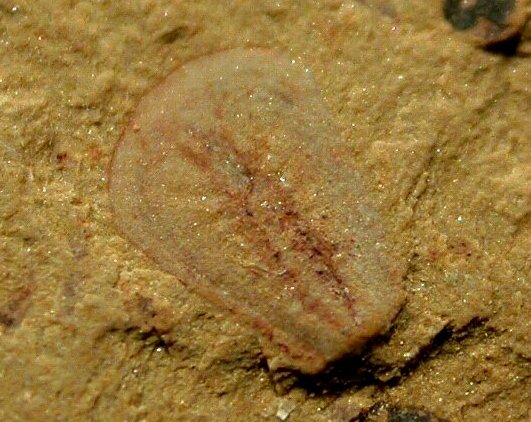 Nektaspida was once considered an informal trilobite clade, but more recently it is considered a stem group of Subphylum Chelicerata. What is not disputed is that Nektaspida and Trilobita have close phenotypic affinity. 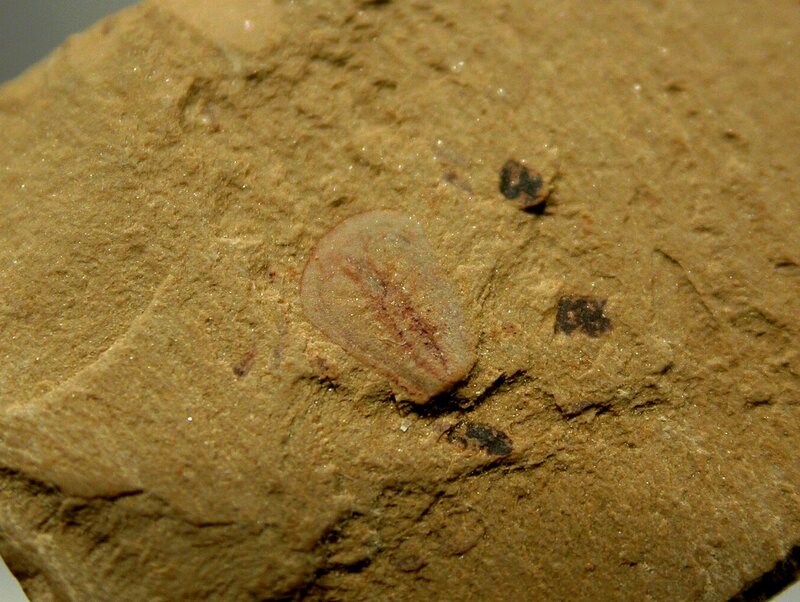 To complicate things even more, Primicaris is extremely close in appearance to the putative Ediacaran arthropod Parvancorina, as well as the early Protaspid development stage of some Cambrian Redlichia trilobites. All this said, it is straightforward to hypothesize a phylogeny from the unsegmented Parvancorina, to Primicaris with its apparently nascent cephalon, to Naraoia with clearly differentiated cephalon, to the Helmetids (Kuamaia, Skioldia, or Panlongia) with undisputed cephalon, thorax, and pygidium, and finally to the early Cambrian Redlichlia trilobites with their truly distinct cephalon, thorax, pygidial segmentation and other trilobite-like traits. 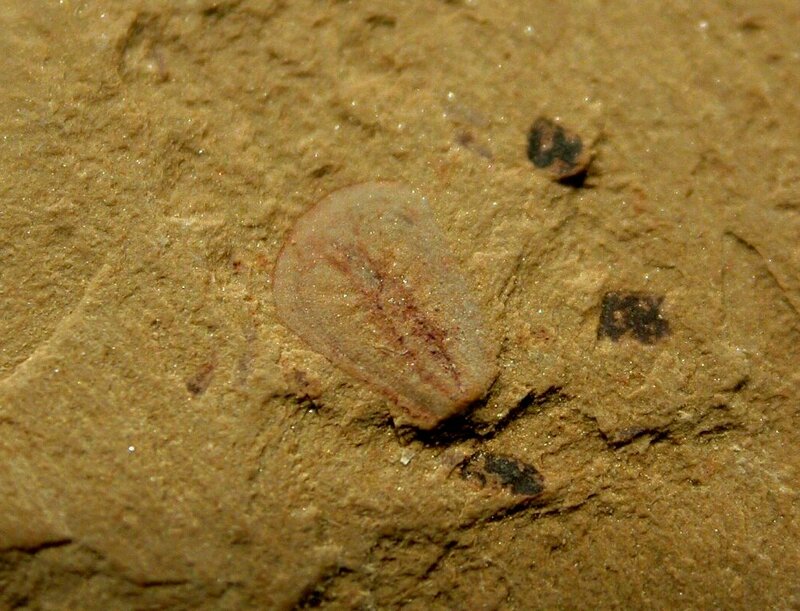 Of course, such a phylogeny (ancestral path) would make Parvancorina (or a very similar animal) an ancient ancestor of all the trilobites, and at least potentially, Primicaris the oldest trilobite relative in the early Cambrian fossil record. The above figure depicts one of many lineages leading to Trilobita, beginning with the putative Vendian arthropod, Parvancorina that ostensible lacked segments, then Primicaris that seems to have a natant cephalon, the naraoiids with more distinct cephalon, then the the Helmetiids (e.g., Kuamaia, Skioldia, or Panlongia) that exhibit differentiated cephalon pygidium and thorax , and finally Redlichia, a truw trilobite.